Chamber music, solo or orchestral playing? Did you know that the Cutty Sark’s real name is “Ferreira”? My interview today with Thomas Deakin and Andy Johnson turned into a history lesson as well as a talk about their newly formed brass quintet. In November 2013, Ferreira Brass was established by the principal brass players in Trinity Laban Conservatoire’s “Side by Side” project – an orchestral performance of Rachmaninov’s Symphonic Dances. After playing together in this concert, trumpeter Robert Landen asked the principals Thomas Deakin (trumpet), Thomas Pollock (French horn), Declan Goodhall (tenor trombone) and Andy Johnson (tuba) if they would like to start a quintet. 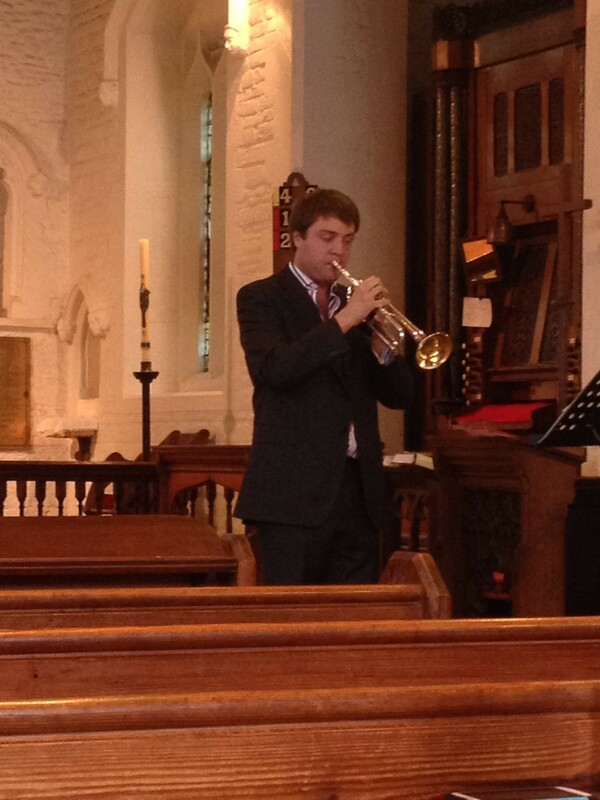 Ferreira’s debut performance took place at the Philip Jones Brass Ensemble Competition on 4th March 2014, where they played Malcolm Arnold’s Brass Quintet No 1, and received positive feedback from the adjudicator Amos Miller of Onyx Brass, who commended them for their professional sound. They have since then adapted the set-up of their group. Unlike the traditional brass quintet lay-out with the trumpeters at opposing ends of the semicircle, Ferreira decided to place the trumpeters in the middle and the French horn at the end to create an easier balance. A massive disadvantage of playing the French horn is that the bell of the instrument points to the side, and therefore the sound is directed to the side, and the horn is in danger of being drowned out by the rest of the ensemble. In the lead up to the Philip Jones competition, the ensemble received coaching from professional French horn player Stephen Stirling who taught them how to function as a group and ignore the challenges of the repertoire. Their coaching sessions involved rehearsing playing with their seats facing back to one another – to learn about playing together using sound alone. Thomas Deakin said that from this experience they learned how the addition of seeing one another when playing does help, but it does not need to be relied upon. Ferreira are looking forward to their first quintet concert on 10th June at 1pm in the beautiful Old Royal Naval College Chapel. Remember this is the very same building which gets blown to smithereens in the superhero movie “Thor 2” – let’s hope this doesn’t happen again when Ferreira perform Malcolm Arnold’s Brass Quintet No 1 and Oskar Böhme’s brass sextet. See Ferreira Brass’s new website for full details of their upcoming concert, and read the full interview transcript below. AM: So I know you’re all postgraduates? AM: Oh, Declan’s fourth year. So when did you form the group and how? TD: It was this academic year. It was probably about October/November time. It was after the Side by Side project. AJ: Yeah, it originated from the Side by Side project. It was basically all the principal players from the orchestra. So Rob Landen, the other trumpet player, kind of asked everyone. (To TD): But you were principal, weren’t you? AJ: Tom Pollock was principal horn, Dec was principal trombone and I was principal tuba. AM: The Principals Group, basically? AM: What was Side by Side – was that the concert with the staff? AM: And who chose the name Ferreira? AJ: – banding names around! There were so many quintets, and a lot of names were already taken. So we were trying to come up with something original but relevant to the location. [To TD:] So, you suggested doing something with the boat [the Cutty Sark], didn’t you? And Dec did some research on it and found out that its real name is Ferreira Ship. So it’s such a unique thing. AM: I did Google it. The first thing that comes up is Ferreira Brasserie for some reason. AM: But then it’s you guys. AJ: That’s good. We’re aiming for number 1. AM: Do you think once you’ve finished at Trinity, you will want to stay together as a group? TD: We’ve already had a chat about that actually. AJ: Yeah. It clicked so quickly. We all get on really well, and I think (next year) most of us are still around, or it’s commutable distance to where we’re going to be. So it’s still worth carrying on. We’ve got a concert at the chapel in June. And Tom’s a computer whiz, so he’s done a website. Well, it’s in progress. So the promotion’s kicking off now as well. So we thought it’s worth sticking with it. TD: That’s why it’s there! AM: So I know you entered the Philip Jones Brass Ensemble Competition. Can you tell me more about this and how you actually did? Did you come in a certain place? TD: We didn’t come in a certain place, but we got some very nice feedback: both the official feedback and then feedback from members of the audience who said they enjoyed the performance. AM: Who were the adjudicators? AJ: It was Amos Miller. He plays trombone for Onyx Brass. He made some nice comments, saying we had a professional sound. It was really constructive. The things that need working on, he was quite clear about that as well. TD: He was also saying about using furniture to use as sound barriers! AM: That’s a nice idea – as a horn player, I approve of that because you feel a bit crowded in otherwise! AJ: The two trumpets are now sat together. AM: It’s a nice set-up. AJ: Yeah, we like it. It’s one of those things you can experiment with all different sorts. We’ve probably tried every different seating arrangement. AM: What repertoire did you play for Philip Jones? TD: The Malcolm Arnold Quintet. AJ: It’s three movements and fifteen minutes long. Fifteen minutes was the requirement for the competition. AM: What did you think about the actual experience of the competition? Did you find it quite intense or did you actually enjoy it? TD: I did enjoy it. Before the competition there was not a lot of backstage space. It was all just a bit crowded. There were quite a few groups playing – it must have been eight or nine groups. And they were all crowded into the one room. TD: But when we went on it was good. It was nice playing in Blackheath. AJ: It suits brass really well. AM: Would you enter other competitions externally? AJ: Or sometimes two days if you get through a round and then you have to be available for the next round. TD: Going forwards, next year we’ll apply to whatever we can find. TD: It’s for education and community work which is definitely on the cards for us. AJ: There are a lot of regional, less well known competitions as well, which we could always get our teeth on before we do the real big ones. AM: Do you have any particular favourite repertoire? TD: We like the Malcolm Arnold as a group. We quite like the Ewald quintets. We’re also looking into the Oskar Böhme sextet. That’s going in the concert in June. It’s similar to Ewald in style. AM: So who’s the sixth player that you need to get in? AM: Ferreira Brass Plus One?! Why do you like that repertoire? Is it particularly good for the strengths of your group? AJ: Or flipping it on its head: it brings the weaknesses up, and improves them as well. It’s one of those pieces that if it’s played well, it’s really nice to listen to. We’ve really got our teeth into it. It’s satisfying for us to play. TD: We all enjoy playing challenging music. AM: So your concert on June 10th is a lunchtime concert at the Old Royal Naval College Chapel. Will any of you perform solo music during the concert, or is it all just going to be quintet music? TD: Not this time, but it is something that we’ve talked about for future concerts. AJ: Definitely! It’s a great way to save everyone else’s lips when one person does a solo. AM: Except for the soloist! AJ: It changes things up a bit as well, so it’s not just the quintet sound all the way through. AM: So, how often do you manage to rehearse? TD: We mostly do at least once a week, but often twice. AJ: Normally 3 hour sessions. I commute from Northampton and Tom commutes from Luton. So it’s got to be worth coming down for. We’re pretty good at making good use of the time too. It is quite focused work. AM: So in rehearsals do you correct one another’s mistakes or do you just keep quiet? AJ: We’re very open. Sometimes to the extent that we have to remember it’s not personal. But I think that’s great because it’s making good use of the time. TD: We all trust each other enough to know that everyone will say what they think – pretty much in a straight way without any messing around. We all understand that we all want the best out of the group. AM: Can you tell me about any coaching you’ve had from professionals? TD: We had a session with Graham Lee on Jim Parker suite. We’ve had Stephen Stirling who came to give us a coaching session on the Malcolm Arnold. It was really helpful because he took us along the side of how to function as a chamber ensemble irrelevant to the fact that the music is difficult. AJ: He brought some different things to the group – like making us turn our chairs around and play facing outwards – where you’re trusting each other to play together. TD: His whole idea with that is that you are using the sound – so when you all sit facing the normal way the addition of sight helps rather than you rely on that [alone]. So you use every tool that you can find to help you through the piece. AJ: He also taught us how to “pass a note” around the group, leading to the next person. 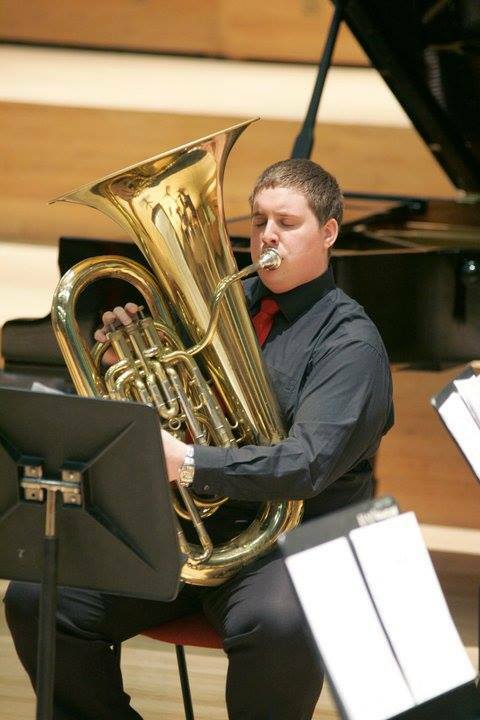 As a tuba player, I don’t lead a lot, so it was great to be taken out of that comfort zone. It’s difficult with a big instrument to move, but you just have to get on with it. AM: What do you think is the greatest challenge playing chamber music? Tuning issues? TD: If we had to pick one… It’s difficult because they all come together, don’t they? AJ: You’ve got tuning, but a lot of the time when you’re playing in tune, it’s the balance of the chord which is the issue. TD: Learning each other’s parts. AM: Do you have discussions about how to interpret the music? AJ: We’re quite good at trying everyone’s ideas as well. It’s quite democratic. AM: Looking ahead to the future: what sort of things in the long run would you like to do? TD: We all come from different places, so we might go and play in a church in everybody’s hometown. AJ: Once we’ve got the website up and running, we can start proper marketing – e-mailing groups like National Trust and maybe going and playing at their houses. It’s just about getting your name out there so much, so that people can’t avoid it!